Thanks for tuning in last night. Extra special thanks for all the lovely feedback I’ve received for the show, I’m really glad so many of you enjoyed the chilled grooves. Big ups everyone. Don’t forget you can download all of my radio shows via the NSB Radio archives. After a quiet February, Hubie Sounds is back on NSB Radio tonight with another special show for your lovely ears. Tonight I’m going to chill you out with two hours of laid back grooves from the realm of trip hop – a genre that’s enjoyed a powerful renaissaince recently in contemporary music. Hubie Sounds 108 – Tuesday 8th March @ 9pm GMT – live and direct on NSB Radio! Morning all. Thanks for tuning into my Summer Special last night. I hope it left you with that warm, summery feeling inside, even if it might not be particularly summery outside wherever you may be! For what it’s worth, it seems to have done the trick here in London as the sun is blazing away today. Game on! Big ups everyone, see you again soon! Hi everyone. Here in the UK summer is more or less in full swing. Summer Solstice was just a couple of days ago and the sun has been shining in the sky, most of the time anyway! So to celebrate, this Tuesday on Hubie Sounds I’ll be presenting a Summer Special, featuring loads of summery vibes, laid back grooves and beach party tunes from the musical realms of reggae, soul, funk, hip hop, breaks, house and electronica. 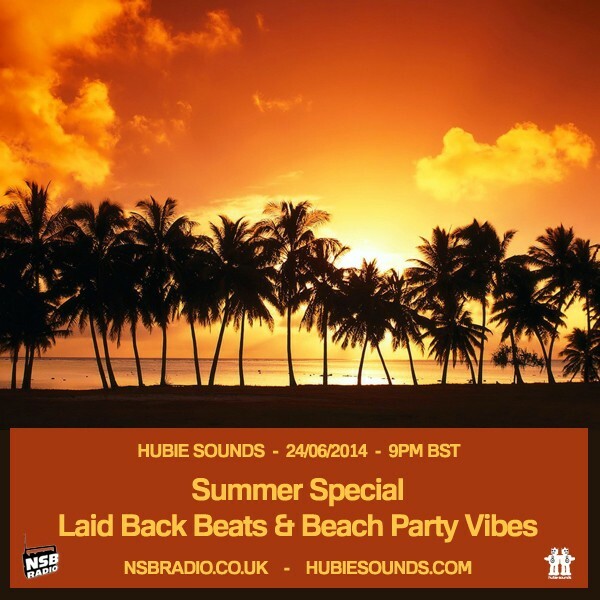 Hubie Sounds 084 – Summer Special – Tuesday 24th June @ 9pm BST – live and direct on NSB Radio! Thanks for tuning in and chilling out with us last night, we hope you enjoyed the show! Make sure you check out the next edition of Hubie Sounds on Tuesday 10th May @ 9pm UK time – live and direct on NSB Radio!